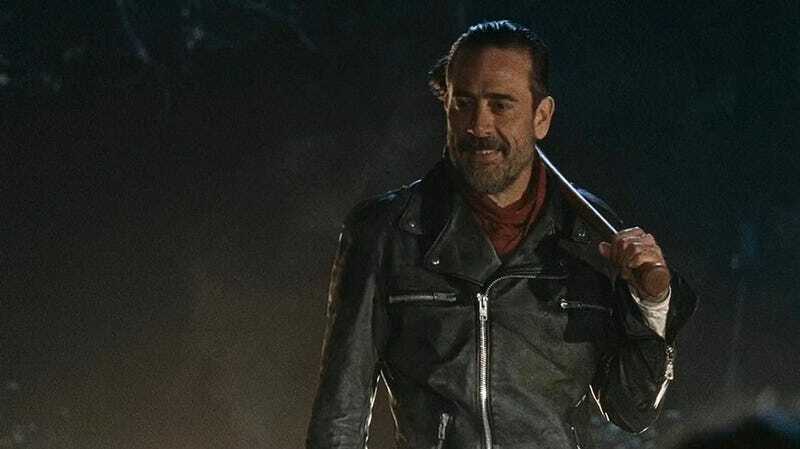 Did you think that we were done with the “Who will Negan kill in The Walking Dead season premiere?” question just because the season premiere finally aired? Ha ha, nope! Because some very strange new footage has surfaced that indicates the show had someone else in mind to fall victim to Negan’s bat Lucille. As we all know—unless you haven’t watched the finale, have stayed away from all TWD coverage since Sunday night, and yet you decided to read this article, in which case you confuse me but I admire your gumption—Negan actually killed two members of the group: Abraham first, and then Glenn after Daryl very stupidly acted out. Let’s go over this a bit. Now, last Sunday’s episode did portray Rick having visions of Negan killing all the other captives, a litany of all the potential future victims should Rick try to defy the leader of the Saviors. I believe those small snippets of everyone getting hit by the bat once likely accounts for the rumors that The Walking Dead filmed footage of all of the captives being killed. I don’t think they all got full, Glenn-length death scenes, even to throw off fans and set spies; shooting 11 scenes would be an incredible amount of time and money, especially with the special effects of crushed skulls and loose eyeballs and such. That said, this video definitely shows more than the “vision” Rick had of Maggie getting hit. The shot of her rising her head up after being hit by the bat, while blood streams down over her face, particularly makes me wonder if this was filmed as a potential alternate death. Of course, there are plenty of oddities with the video: The editing of the footage is very strange, there’s that weird gray bar in the middle of the screen showing the footage, and there’s always the potential someone with a ton of time on their hands is looking to elaborately troll the internet. At any rate, I’m not convinced it isn’t legit. So let’s talk about what it means. Honestly, for the first bit of the premiere, when it looked like the show was going to skip over a third-person view of the bludgeoning, I thought Maggie was going to be the victim. While the murder of a pregnant woman would be brutal, it seemed like TWD was going to do it in the best/least worst possible way—a way that would have justified the cliffhanger. By showing the murder in first-person in the finale, TWD gets all the visceral thrill of killing a main character without the baggage of specifying the character. And if the season seven premiere skipped a third-person view of the murder—as it seemed like it was going to do there for a while—The Walking Dead could have done killed something amazing, which I mean in a completely neutral way. It could have murdered a pregnant female character, which would have made the Sansa Stark wedding night controversy look like a mean Tweet, and presented the emotional impact without actually showing the death scene, minimizing the outroar. Of course, if real, this footage shows the show really was going to graphically beat a pregnant woman to death on-screen, which would have been the very worst. Whether it was done to throw people off or because at some point Scott Gimple realized he was about to show a pregnant woman being beaten to death on-screen and thought, “Holy shot, what the hell am I doing” is unknown, but it’s a little hard at the moment to give TWD the benefit of the doubt on knowing the line between drama and trauma.